Analyst relations professionals increasingly find themselves discussing influencer relations. Don Bulmer uses a nice definition: a systematic way to identify, measure and build bridges with influential people who impact customer perception. SAP’s useful taxonomy breaks this down into clear categories such as customer communities, IT Influencers (such as Industry analysts, developer community, consultants, and bloggers); Universities; Business Influencers (thought leaders); and top SAP partners. It’s a model that most firms would wisely try to emulate. What’s interesting is that some influencers are missing from this taxonomy: journalists, the vendor’s employees and alumni, the investment community, policy makers, competitors and individual end-users (most of whom do not participate in user groups or other communities). Taken together, these missing influencers have a substantial impact on the firms market. Their absence gives a clue about the origin of influencer relations. Influencer relations maps on to the ‘white space’ in most vendors’ public relations programs. Public relations conceptually relates to the whole public: all these audiences fit inside public relations. However, in most companies “public relations” means media relations and little else. Investor relations is siloed in the CFO’s office. Internal communications, which is vital for public reputation, is often part of the human resources function. Public affairs is often in another silo, and its regulatory axis mean it comes under the general counsel’s control. What is called influencer relations is often, in many firm, the left-overs — a disjointed and Balkanised archipelago of neglected audiences looking for an internal champion to take them on. It’s a huge challenge for organisations, and the leadership of influencer relations is one fraught with risks. In particular, there’s a risk that influencer relations will discredit itself by claiming that existing influencers on enterprise ICT spending, like analysts and journalists, have been surpassed by bloggers, which is a claim that no data seem to support. From a strategic point of view, the key issues are identification and evaluation. Don has performed a huge service for our community in sharing the results of an SAP study in which 500 US decision makers in its market. This 2006 study shows that the key influencers on firms with 2500 or more employees are peers, customers, consultants and industry analysts. Bloggers came last out of 23 groups of influencers, lower than law firms, accountants and academics. However, there’s more to the problem of influencer relations than these data suggest. While SAP’s prospective customers report academics as being of low influencer, the firm itself takes a more strategic view, and argues that universities have infinite impact on the firm’s revenues. How can we deal with this dissonance? And how can we act on the insight that research generates? Lighthouse bases itself on action research, a form of iterative and reflective inquiry which enables practice. Our view is that understanding influence on clients is an iterative and reflective process in which professionals in an organisation develop a common view of their tasks on which they can agree to act. Data are fundamental for that process, but the process of bringing the insight to life is one in which the insights of the data are continually mediated through the organisation. For example, data might suggest that there’s little basis for B2B firms to prioritise the media, or for private firms to speak to equity analysts, or for AR professionals to try to influence vendor-funded analysts. However, current practise is strongly rooted in organisations. Data about the external world need to be integrated and collectively interpreted in order to develop deep insight. For that reason, our view is that organisations need integrated communications: that influencer communications, analyst relations and media outreach should be seen as aspects of one challenge. Writing about influencer relations back in 2005 we explained that investors, journalists and analysts are key influencers. We think an influencer relations strategy based on left-overs will struggle to build an understanding of the influencer landscape that will deeply convince other communications professionals. While that integrated strategic overview is necessary, that does not mean that these very different influencers can be addressed effectively with one communications programme. In 2005, when “influencer relations” was often used to mean consultant and analyst relations, we argued that one could not expect to be successful if you added management consultants into an analyst relations programme, simply renaming it “influencer relations” and using the same techniques. SAP and most other firms conducting vendors relations, of course, understand this. Their outreach to academics is different from their communications with bloggers and their relationships with analysts. Cows and cabbages need different foods from the same farmer. Thank you for picking up on my blog and for your insights. It is important for me to clarify a few points. Additionally, to your point on the impact that our University Alliance program has on influencing purchase decisions is relevant. I agree with your analysis that many firms are approaching IR as an extension of their AR activities. PR is also a common starting point. I also agree that several firms are struggling to make the migration successful, because they apply the same approach to different types of influencer. Cabbages and cows, as you say. Perhaps the underlying reason for this is the starting point. Using the old joke, if I was going to where you want to go, I wouldn’t start from here. My experience is that the most successful influencer models are originating from within operational marketing departments, not AR or PR. Thus, they are staring from a premise based on Influencer Marketing, rather than Influencer Relations. The key difference, I think, is that Marketing has (or should) have a sales goal in mind, whereas ‘Relations’ is often seen (correctly or otherwise) as an end in itself. You note that “Analyst relations professionals increasingly find themselves discussing influencer relations.” I wonder if you have any ideas on why this is the case? I’ve posted some expanded thoughts here and cross-linked back to you. It is quite amusing reading about this model from Don Bulmer. While the model on influencers has some merit, the key item missing in his model and what he does not do in real life is establish credibility. Why? His spokespeople can’t admit to the truth. His execs patently tell tall tales. This is why ICT analysts get annoyed. The lack of truthfulness or credibility in the model reveals a troubled program or organization. As we may be keen to assess his damage. Frankly, his analysts are out of control. His partners talk behind his back. And he can’t seem to buy out all the user groups like ASUG. I guess maybe if you offer a grant to a university professor or pay a business thought leader to speak on your behalf with your CEO, you can declare success. Influence models must be built on relationships and trust. If you don’t engender credibility and you don’t reach out to build relationships, you have zero influence. This is not nuclear science. This is an art for building relationships. I fully agree that trust and credibility are requirements for any ‘relationship’ program, role or function to be successful. The critisism about SAP’s approach made by the “Average ICT Analyst” is very narrow and not fully informed/representative, I fear. I am not certain what experience this analyst has had with SAP. We do work with 1000s of analysts and like most vendor companies – we have a tiered/ranking model to support our engagement with them. Perhaps his/her issues are an affect of this. We certainly do not work in a pay-for-play model (we don’t buy favorability) with any influencer type. In my opinion this is a quick path to loosing credibility and integrity of any influencer program. We often battle compeitiors who enlist these types of influencers in their marketing/PR/sales campagins which require that we defend our position through the credibility of influencers who offer an informed, objective, factually acurate and balanced view of SAP and our strategy. Not all analysts/influencers have a positive position on SAP and this is something that is to be expected. Believe me, we have plenty of critics – some of which are actually good advisers based on their critical and informed views. In addition to trust, the success of our model requires objectivity of the influencer – otherwise there is no integrity in the relationship. If their [influencers] business model is based on producing quality research education and advice to support decisions – they must work hard to ensure that their opinions/research are fact-based, balanced/unbiased (in any direction) and helpful to the decision process. 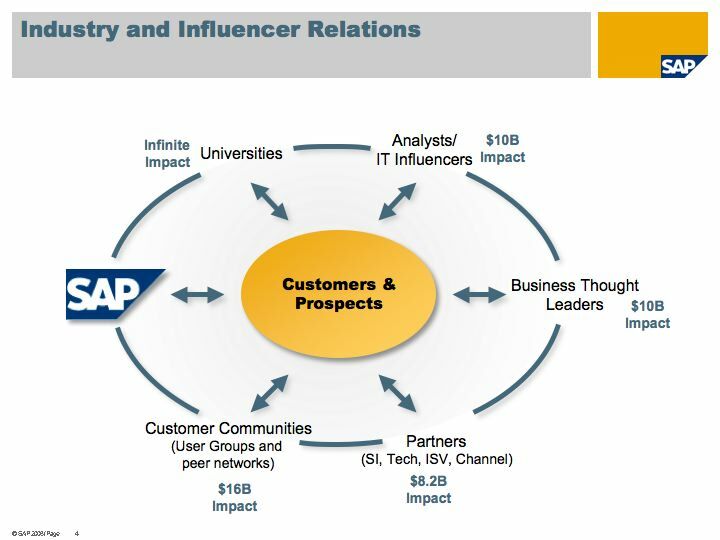 The model of the larger Industry and Influencer program at SAP has been validated over the past 18 months and is very well accepted by our new top management. The value of the program is based largely on the quality of insight that we bring into the company from each group we work with (customers, partners, analysts, business thought leaders, academia) to help contribute to management decisions on strategy and go-to-market activities. In this model we do engage in consultative engagements with some key influencers where we have a trusted relationship and where their experience and view points are highly regarded by our executives (e.g. they give good advice). In the case of customers we work with a federation of independent SAP User Groups (called SUGEN) to bring input into SAP through a combination of 360 degree research (on specific solutions/products ); voice of the customer surveys (where they rate/rank SAP on the end-to-end experience in working with us); CEO/CIO executive exchanges (small groups that meet regularly with our top management to provide feedback and where we expose them to roadmaps and strategy adjustment); and Customer Influence Councils where we have begun to get direct customer input to help us shape, reshape and measure (with joint KPIs) the value of programs such as Enterprise Support and our 5-10 year portfolio strategy. The SAP User Groups are independent entities and are largely volunteer driven. They put an extraordinary amount of effort in these newly developed programs (just mentioned) to make them successful. Through this very open and transparent model we have begun to create an extraordinary amount of trust and cooperation. This is not to say that we always have full agreement on issues with every customer, analyst/influencer. But we put a considerable amount of time into discussion/debate that in the end will help us to make good and informed business decisions that hopefully brings value to our customers and partners. We certainly have experienced a number of lessons and challenges in the early days of these programs – some of which have played out in the media (e.g. our enterprise support strategy). Needless to say SAP is a learning organization and these lessons have contributed to making the programs and relationships even stronger and more important. If the ‘Average IT Analyst would like to reach out to me directly, I would be greatful and very interested to understand his/her issues, and opinions. I can be reached at [email protected].